From the Baldwin County Courthouse, go east on Hancock St. one block. Turn right (south) on Wayne St., which becomes Business 441 South. Follow Business 441S for 1.8 miles. Turn right on Allen Memorial Drive. Drive 0.6 mile to Harrisburg Rd. Turn left and go 0.4 mile on Harrisburg Rd. Turn left on Hall St. and go approximately 200 feet to its dead end. 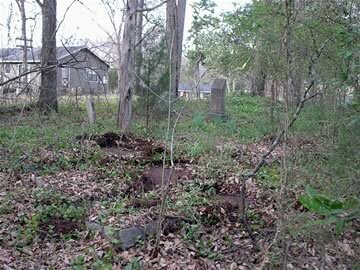 Cemetery is on the right at the top of the hill, approximately 150 feet from Hall St.
wife of A. F. Killings. She was a kind and affectionate wife, a fond Mother, & a friend to all. Age 66 yrs. Last name difficult to read.